At our August 2003 meeting we welcomed Alix Stredwick, a long term Tower Hamlets LCC member, who explained about the Cycling for Women project she is currently undertaking at the Women’s Design Service, funded by the national lottery's New Opportunities Fund. The project was launched in September with a photoshoot in Brixton with Deputy London Mayor and Green Party Assembly Member Jenny Jones. Did you know that government figures for 1995/97 show that on average, men make about two and a half times as many bicycle trips as women, and cycle about four times as far? And that the Public Transport Gender Audit carried out by the University of East London found that women account for only 4% of journeys made by bike? The Women's Design Service, a London-based charity that works with women in urban environments, is undertaking a year long pilot project called Cycling for Women based in Camden and Lambeth. The project seeks to understand and address the reasons why comparatively few women compared with men cycle as a means of transport in London. Cycling for Women aims to encourage and enable more women to cycle, and to help inform policy-makers on how to make cycling an easier choice for everybody. But WDS needs your help to recruit women to take part in the project. All expenses are paid by WDS, free training is provided and some women may even end up with a discounted price bike! 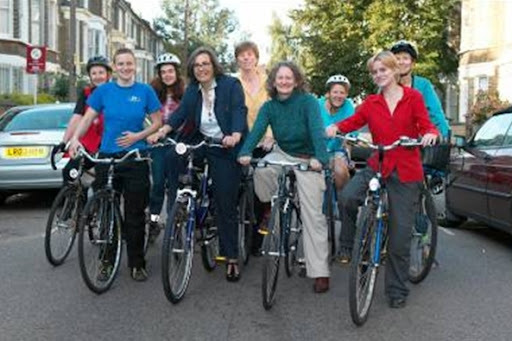 - Action Research: Six women in each borough are kitted out with equipment on loan from WDS and free training in order to confidently and safely take up cycling as a means of transport. - On-road Cycle Training sessions: 30 women in each borough will be given free on-road cycle training in groups of 3-5 women in order to increase their cycling confidence. - Maintenance Classes: Free women-only classes for women in each borough. activity and women encourage other women and men to do the same. - Focus Groups: Share your views about cycling, either as a 'cyclist', 'non-cyclist' or someone who can cycle but does not do so regularly. - Surveys: Complete paper- or phone-based survey about attitudes towards cycling. Participants can be women of any age over 18, of any fitness level and cycling ability - including disabled women and women currently unable to ride a bike, as long as they live or work in Camden/Lambeth.